High Accuracy maintained over a very wide viscosity range. No need for different tube sizes. High speed viscosity determination. Labs using our 2-bath TriVisc system are achieving 160+ measurements per hour. Automatic tube cleaning and drying. Workplace friendly. No solvent fumes or fume-hood required. On-site service throughout North America. Extended warranty and service plans available. 6 Tubes per bath for very high sample throughput. Lowest per sample cost in the industry. 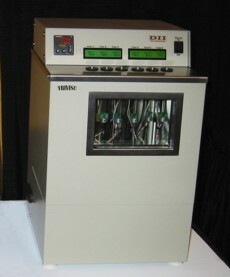 Robotic sampler available for fully automated viscosity measurement.